A new school year brings new opportunities, clean slates, and anticipation of fully enjoying the university experience. 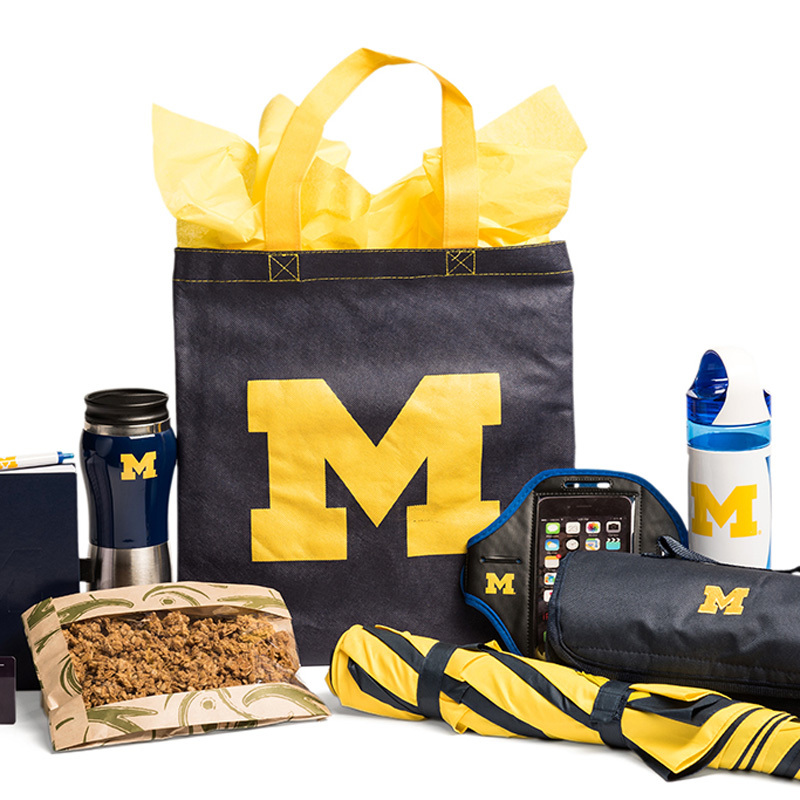 Help your student kick off the new year with a Welcome to Michigan gift package! The package includes “Go Blue” gear for your Wolverine: a cozy blanket, umbrella, journal, keychain, pen, cell phone holder, bottled water, reusable water bottle, travel mug and house-made Michigan Dining granola. You can also add a gift card, sold separately. It’s Show Time -- This package has enough movie treats for your student and all their friends. It includes two liters of soda, popcorn, Doritos, potato chips, and a selection of movie candy favorites. M Gift packages are also available with themes such as Get Well Soon and Good for U, filled with healthy snacks and U-M items. Simply place your order by 4 p.m. (EST) two days in advance of when you would like the gift package delivered. Then your student can pick-up the package Monday through Friday at one of nine convenient campus locations (free of charge) or have it delivered to one of 13 Residential Community Centers for a $10 delivery charge. Just place your order online and select the pick-up or delivery location. For more information, visit M Gift Packages. Proceeds of every dollar spent with M Gift Packages go to support U-M student programs and campus facilities.